Designed in Bondi Beach and named after a street in the neighbouring suburb, Bronte, the Carter is a combination metal and acetate Panto frame shape. 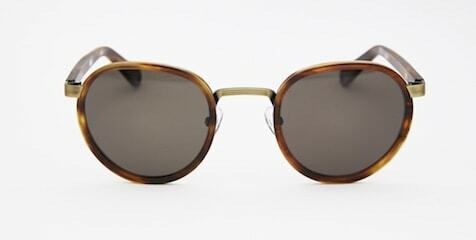 The frame features a cellulose acetate ring secured by a stainless steel rim, and temple arms of cellulose acetate. The frame is hand polished and hand assembled and features a gloss acetate and metal finish. Each pair comes with free carry case, microfiber cloth and maintenance and cleaning kit.TECHNICALAt the heart of Pacifico Optical is our pride and commitment to producing eyewear of the finest quality.â€¢ACETATE: The frames are hand crafted from cellulose acetate sourced from Italian supplier Mazzucchelli.â€¢HINGES: The frames are held together by Italian engineered 7-joint nickel silver rivet hinges from manufacturer Visottica to ensure quality and precision â€“ built to withstand the knocks and bumps of a true adventure.â€¢LENSES: Sourced from Carl Zeiss Vision, the lenses are made from Polyamide â€“ a plastic polymer which is shatterproof and light weight. The lenses are class 3, provide UV6 400 protection and are suitable for driving, meeting international standards including Australian AS/NZS 1067:2003, American ANSI Z80.3-2010 and European EN1836:2005.â€¢COATINGS: The interior of each lens is coated with a multilayer anti-reflective coating to reduce glare, whilst the exterior is hard-coated to prevent scratching.â€¢HORIZON LINKS: Our signature horizon links at the tips of the temple arms will connect to our glasses cords as a convenient retainer and to prevent losing the frames from your head, overboard or overland!FITâ€¢The size 48 frame is a medium fit.â€¢The total frame width is 142mm.